This past weekend was Tax Free weekend in Georgia and I planned to take full advantage of the great deals! I decided to take Kye with me and head down to Lake Park (about a 25 min drive) to do a little shopping at the outlets. All I can say is that shopping is MUCH different with a baby! My plan was to head out when he woke up 45 min into his first nap which is ALWAYS does like clockwork…but of course he must have known that I was hoping he’d wake up because for the first time EVER he slept for the full 2 hours without me having to go into his room once! When he did wake up I fed him then decided to wait until the afternoon nap to shop and met Zach at the post office to get Kye’s Passport! His passport picture is hilarious and it’s even funnier that it will be valid until he’s 5! How cool is it though that at under 6 months old he will have a passport and at 7 months old he’ll travel outside the country (going to Cancun yay!)? So cool! This time during his nap he DID wake up at the 45 min marker so I quickly threw him in the car seat and headed down to Lake Park. The deals were awesome! He slept in the car seat/stroller and I tried on lots of cute new things. He woke up and got fussy and I realized it was 3 and therefore time to eat. I did something I never thought I’d do, I nursed him in the dressing room! It worked out great because I was able to totally take off my shirt (didn’t have any worries about milk leaking all over my clothes) and he did his thing and I could go back to shopping (although the shirts fit me MUCH differently with full breasts versus empty ones haha). I was proud of myself for nursing him in the dressing room and honestly it was a very good experience. Shopping has always been one of my favorite hobbies. I LOVE getting a good deal! It’s such a thrill and now that I have a baby I get to find good deals on baby clothes which is really fun!!! While I had an awesome time and did find some great deals I was hoping for, shopping is just much harder with a baby. 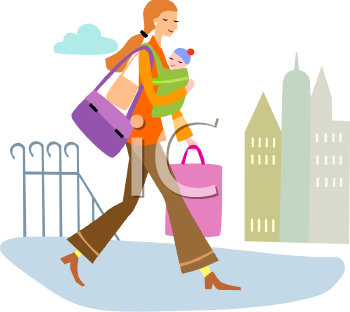 It takes WAY longer because you have to navigate the stroller through the tightly fit store, have to constantly be checking to see if he’s okay or if he’s dropped his toy yet again, and you have to stop for things like feedings and diaper changes. It can also be embarrassing because when he wakes up crying everyone looks! It’s also kinda awkward because people constantly walk by him and say “aww” and I have no clue how to respond to that!!! When people say, “Oh he’s cute.” Then duh I say, “thanks.” But when they say. “aww” what do you do? You don’t thank someone for an “aww” so I just kinda awkwardly smile! haha! I think the toughest thing is the car situation. You put him in the car seat, drive to the store, then out of the car seat, into the stroller, into the store, back into the car seat, drive to the next store, then out of the car seat, into the stroller, etc. It’s MUCH easier to shop at a regular indoor mall than it is at the outlet because the stores are soooo spread out at the outlet that I had to drive to each of them. While in Gap Outlet a little boy who looked JUST like an older version of Kye came over to the stroller and started to play with Kye. He played with Kye’s toy and even touched Kye. I didn’t mind that at all and just said, “be gentle” to him when he touched Kye. He was a sweet little boy and spent a good 10 min with us before his mom barked for him to go over to her. I felt bad that he was getting in trouble so I told the mother that he was being so sweet and was a great boy and guess what his mom said? She said, “well that’s a rare occasion!” What is that teaching that child? He was PRECIOUS and his mom didn’t even see it! I gave her a compliment and she put down her child in response. It made me feel so bad and helped me make a little mental note to NEVER say such things about Kye. Even if she was joking, which she wasn’t, that’s just wrong! I totally agree with taking Kye with you. I've always taken Damian everywhere with me and I think it has helped him learn to behave. As long as I take him something to do or eat then he is a happy baby. At two I think it is much easier to run errands with just the two of us. Sometimes it is harder with more people because he will try and show off. I don't think you can ever go wrong with spending quality time with your baby.